Fuji has said that it believes its X series of cameras have really taken off because people are put off by the weight and bulk of DSLRs. First launching in 2010 with the X100, a premium compact camera housing an APS-C sized sensor, the X range now includes the X100, the X10 and the most recent addition, the X Pro1, the company's first compact system camera. Although the price points aren't too dissimilar from some DSLRs, one of the biggest advantages of these cameras is their small size and weight. Speaking to TechRadar, Fujifilm Imaging's senior vice president Adrian Clarke said, "A lot of people are beginning to feel that - no disrespect to SLRs - weight is becoming more of an important factor with photographers, and, something that works well and is easy to use but is very pocketable is very attractive to them." 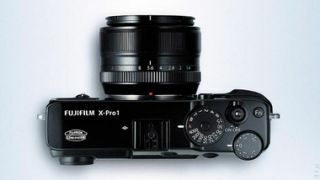 The X Pro1 marks Fuji's return to interchangeable lens cameras, after it bowed out from the DSLR partnership it had with Nikon. "I think nowadays, people don't particularly like to be seen with a great big camera, it looks like showing off, it's too much, it's too obvious. People like to take great pictures with minimum effort and you can do that now with modern equipment." The X Pro1 currently retails for around £1500, body only. Last week, Clarke also told us that he hopes it will be the first in a long line of interchangeable lens cameras for the firm.